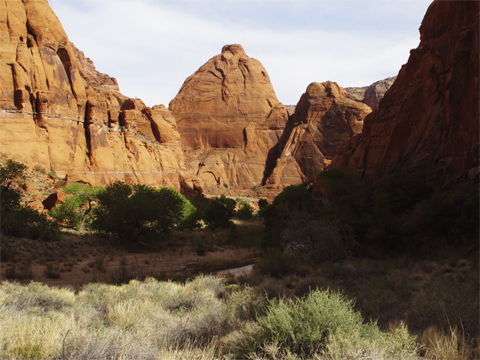 After supering my hives in April, I jumped in my truck, drove to southern Utah and hiked the 39 miles of Paria Canyon. 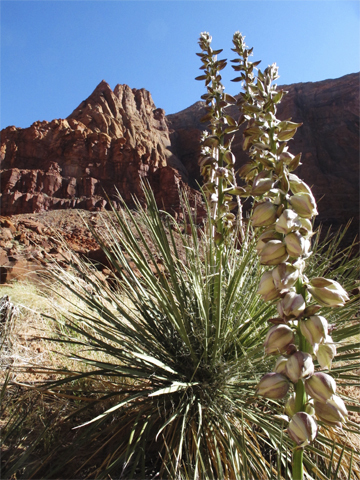 This is a brief story of that amazing trip – and one wonderful story about some feral honeybees I met in the Canyon. 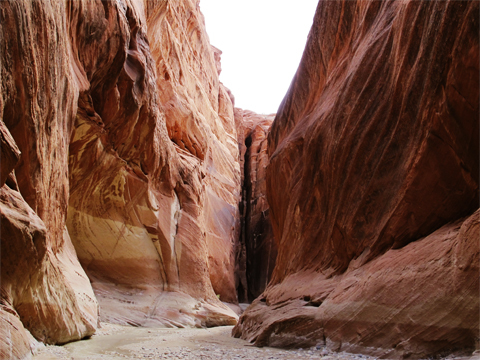 A few tips on walking the canyon can be found at the end of this blog – it’s worth the time to do it. (My apologies if the formatting of this is odd, I keep fixing it, and previewing it, but when I publish it – the entire thing goes haywire). 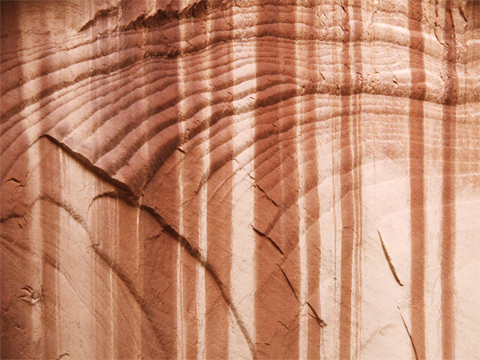 Paria Canyon is in the Vermillion Cliffs area of Utah. 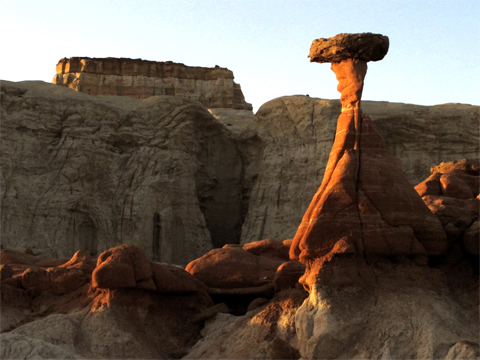 It’s an area of incredible beauty, and truly amazing formations. This is just one of the many “mushrooms” of stone that have formed in this area. 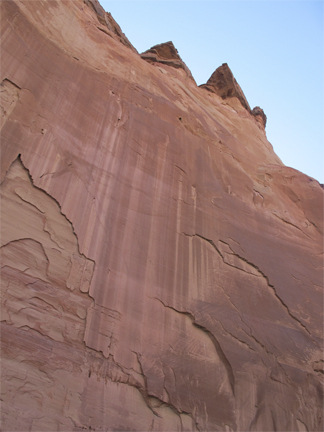 Wind and water have worn away the softer stone (the stem), while the harder stone (the cap) remains perched on top. 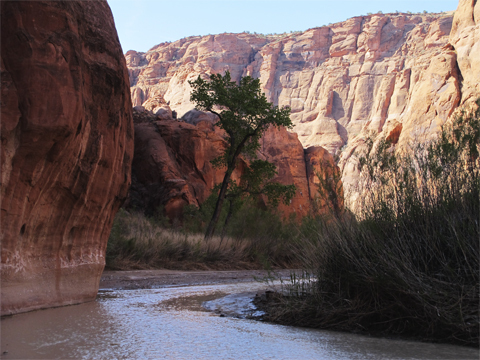 The hike in Paria is a walk down the river, literally. Down the river, through the river, and more often than not, in the river. 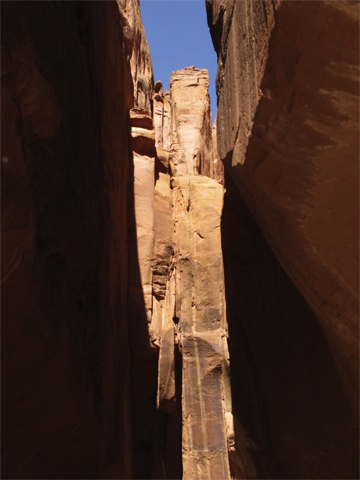 The route takess you though a succession of geologic time, going from narrow canyons with iron red walls that reach hundreds of feet into the sky to wide open desert of tumbled rocks. The walk starts amid solid limestone rock that once was sand dunes. 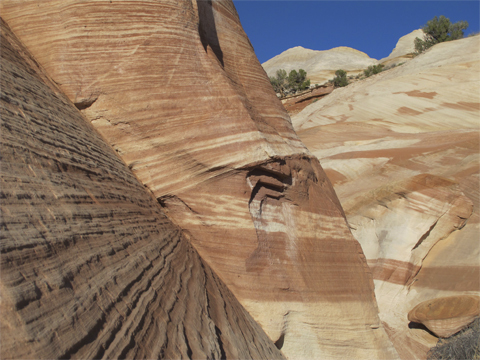 Their red and white sands now stand as hills and cliffs that retain unworldly swirls. 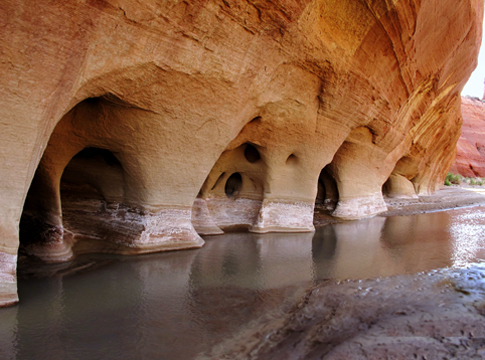 As you head down river, the rock walls around you rise, until you are in a natural cathedral of stone. From there as the cliff walls rise above you. 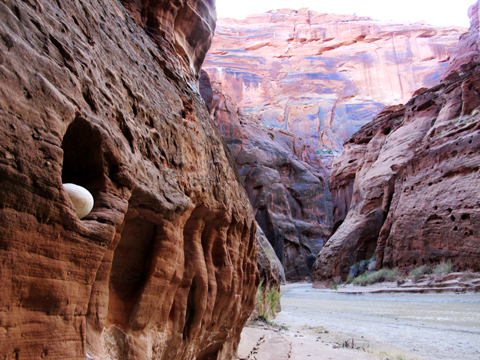 A few miles down river, I took a brief side trip up Buckskin Gulch. 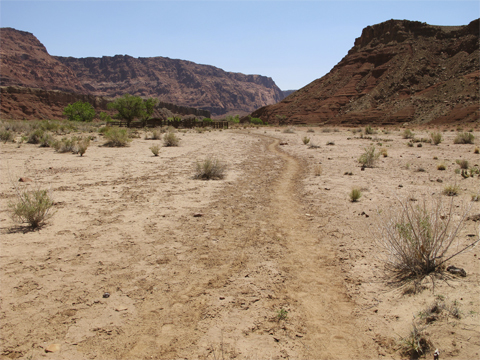 This is an even narrower stream bed cut over time. Folks often come in this way – but it’s 13 miles of this tight, narrow passage with no stopping. I only walk 5-6 miles a day. Plus I think 13 miles of a tight passage might prey upon my nerves. But an hour’s stroll up gulch was fascinating. Hikers are warned about flash floods on this hike. 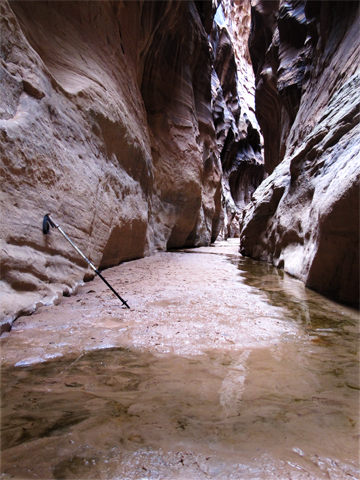 The way is narrow, and flash floods come fast. I didn’t experience a full flood, but nature decided to give me a small taste of how quickly things change. When I started walking, the river was at most a few inches deep. On the second day I stopped to set up to photograph a pinhole image of the river. (I do pinhole wilderness photography, although my pinhole blog is not up to date). This takes some time, and I was working quite happily under a tree with honeybees buzzing above me, and around me as they collected water. I took the shot, then started putting all my gear away (camera, tripod, camera releases, plates…). The bees started buzzing louder. It went though my mind that the bees in this area are said to be Africanized, but they had seemed quite accepting of me. The buzzing got louder, but no bees came near me. Then I noticed that hundreds of small spiders were speeding across the sand, heading it seemed towards my backpack, perched on a high ledge. “Beyond weird,” I thought, but kept putting the gear away. Then the waters came. Within a few seconds, the area that I had been kneeling with my camera was underwater. The waters kept rising until they were about one to two feet deep, then they stopped. In the mean time, the spiders stopped scrambling – they had gone to high ground, where I had left my pack. The bees resumed their normal tone. The bees and the spiders had felt the waters coming. I figure they felt vibrations in the rocks and perhaps detected sounds that were beyond my hearing. I sloshed on my way thinking : they can feel so much more of nature than we can. The waters never really subsided over the next 5 days. I just got accustomed to walking thourgh the water, often knee deep. I had brief moments of dry walking, over low-lying land when the river took a sharp bend. 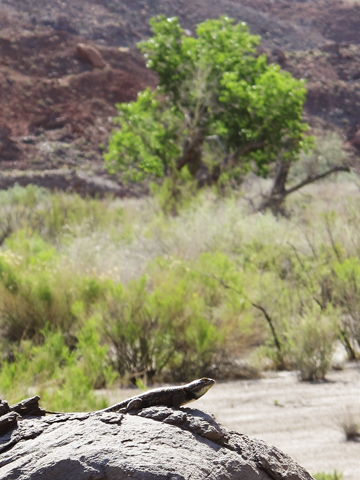 Camping was on high ground – aged cottonwood trees were always a sign that I was above flash flood levels. It was magic, so I’ll stop typing and just show you some photos. While I was setting up a pinhole photo (these take time), Search and Rescue landed near-by to inquire if I had seen some missing hikers. There are lots of places to see, and lots of places to get lost along this river walk. I had not seen them, nor do I know if they were found. “The Hole” all the books stay stop here. It is pretty. I am the child of my mother: if a guide book says “go look at this” I do. She would have wanted me to. 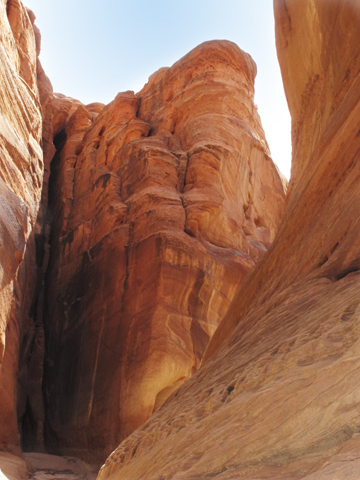 A well known side-trip is to Wrather Arch. 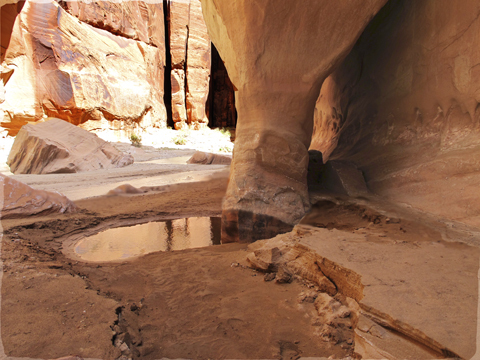 The walk to the arch leaves the river and rises up a gulch through trees. This is those trees seen from above as I neared the arch. 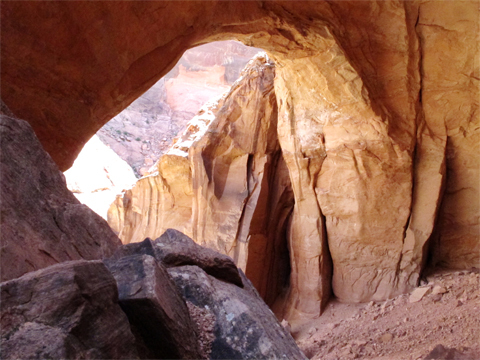 Wrather Arch : There is no “inside” you are outside, looking though the arch to the outside. 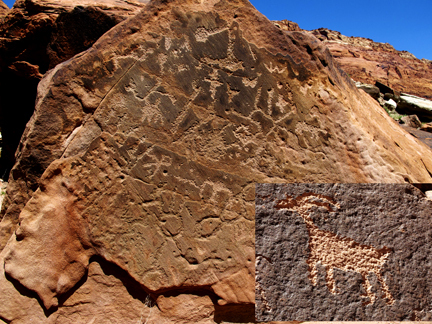 People have lived here for centuries – well before any Europeans turned up. The landscape gets pretty dull towards the end of the walk. 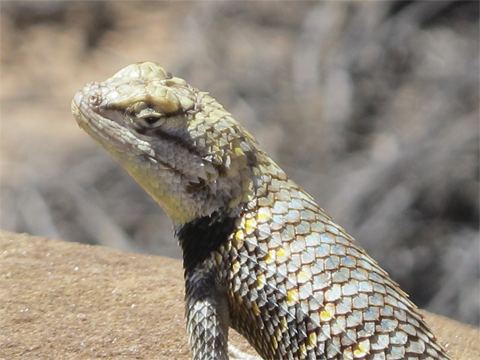 But the lizards are very, very nice. 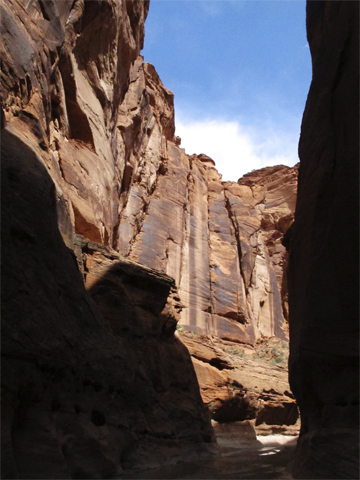 2) Don’t do the whole canyon – unless that’s a goal for you. The best parts are at the top. 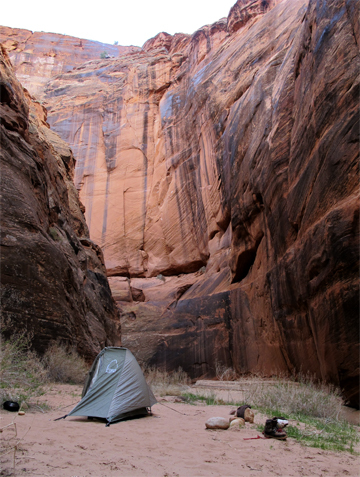 Walk down about 15 miles, find a place to camp. Day hike down to the HOLE and WRATHER ARCH. Then come back up. 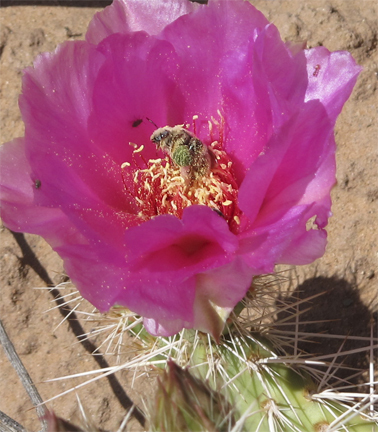 You’ll save the cost of the shuttle (about $175 per person), and you’ll avoid the last 12 miles of fairly dull desert hiking. 3) You can wear learther boots. IMAGE Real ones. Mountaineering Boots. Mine did just fine. They had to be cleaned and oiled after the walk but had no damage. Had I been wearing what we call “desert boots” – gortex/leather boots that I wear daily at the farm, they would have been ruined. I could not carry 7 days of gear and my camera equipment it the little “river shoes” suggested for walking this trip – my ankles would not have survived. 4) Take iodine tablets to put in your water. There are springs, but you may have to drink the water from the river though which everyone is walking. 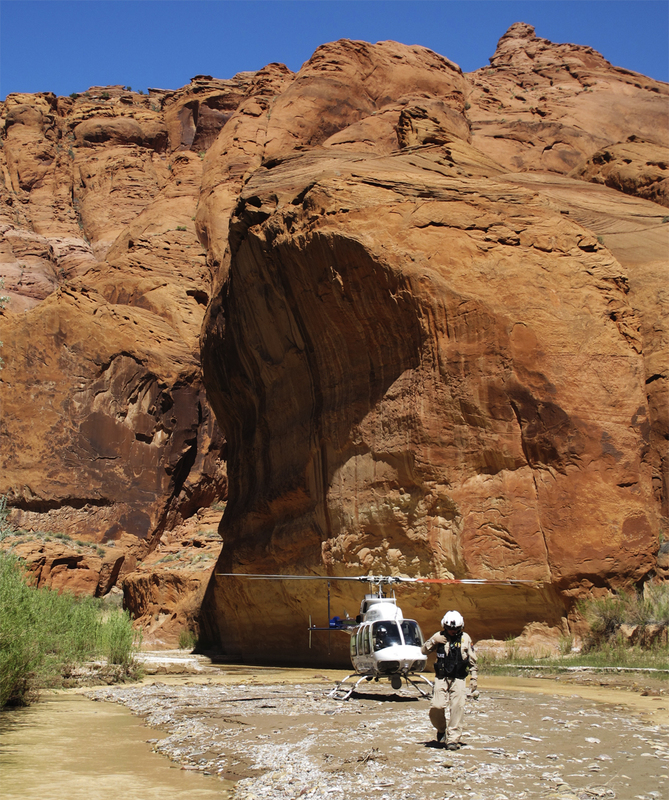 There is too much sediment in the Paria River for water filters. If you must get water from the river, let it settle, pop in a tablet or two, and wait the suggested time, then be prepared to eat or drink a little grit. 5) Take more food than you think you need. If a flash flood comes, you can be stuck for a day or two. 6) Take your time – in my humble opinion, too many people hurry through the wilderness. There is great joy in taking your time to look around, sit by the river beneath the cottonwoods, listen to the sounds around you. We only pass though a place once – even if you return it will be different. Enjoy the beauty of the moment and explore the adventures in change. Change is the nature of nature. Back at home the bee year is in full swing. Since my return, I have again supered the majority of the hives (it’s a good year here, we had sun for a while!). About 15 hives have been split, and, with drones flying, queens are being raised. Frames are being assembled, wired, and waxed. Bottom screens are being built. Bottles of honey being filled for our markets. It’s a good thing I love beekeeping – it sure keeps me busy. How is your bee year stacking up (or what did you do on your spring vacation)? 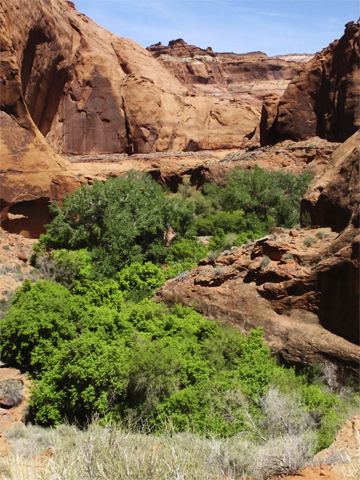 This entry was posted in Wilderness Walking and tagged 2013, Arizona, Canyon, hike, Karen Bean, Paria, photographer, River, Utah. Bookmark the permalink.